NORTH BAY, Ont. 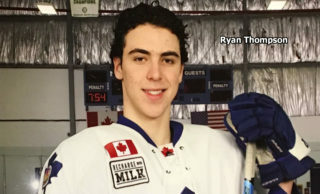 – Mason Kohn’s goal at 17:58 of the second period proved the winner as the Kitchener Rangers skated to a 4-2 Ontario Hockey League victory Thursday night over the North Bay Battalion. Nick Magyar, Connor Bunnaman and David Miller also scored and Sean Allen earned two assists for the Rangers, who have one win and an overtime loss in the young season. 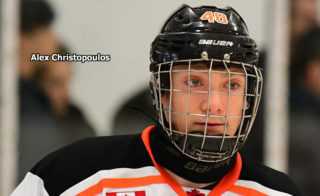 Goaltender Luke Opilka faced 23 shots. Brett McKenzie and Miles Liberati scored late goals for the Battalion, which has lost its first three games. Goaltender Jake Smith made 32 saves before 3,113 at Memorial Gardens. “We got outworked from the drop of the puck until the end,” said Battalion coach Stan Butler. 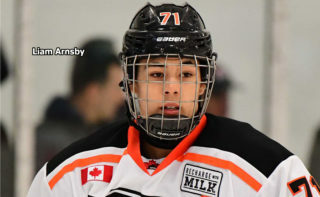 McKenzie’s goal, at 16:14 of the third period, broke a scoring drought of 124:33 dating to Zach Poirier’s goal at 11:41 of the final frame in a 4-1 home-ice loss to the Peterborough Petes last Friday night. 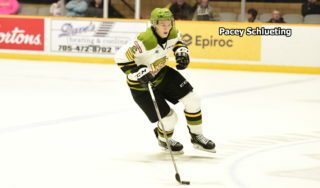 The Troops were shut out 5-0 Sunday night by the host Oshawa Generals. “I don’t think scoring is an issue,” said Butler. “It’s all a by-product of your work ethic. Magyar opened the scoring at 2:03 of the first period. Stationed alone in the slot, he redirected Allen’s right-point shot past Smith’s right arm. Each team had 13 shots on goal, with the bulk of the Battalion’s coming on their lone power play. The Troops’ best chance came in the ninth minute when Mike Amadio whipped a Zach Bratina feed off the left post. Smith produced his biggest save in the 11th minute when he slid to deny Ryan MacInnis. Smith sortied out to challenge Adam Mascherin’s shot off the right wing in the last minute with the Rangers on the power play. Bunnaman made it 2-0 at 9:54 of the second period, converting a Jake Henderson feed from behind the goal line over Smith’s glove. Allen set up Kitchener’s third goal. His stick broke as he fired a shot from the left-wing circle, but the puck went off Liberati’s skate to Kohn, who poked it into an open net. Smith was busy in the period, facing 11 shots. He fended off Kohn in the eighth minute, denied MacInnis at the left post in the 12th, kept Darby Llewellyn from grabbing a loose puck in the 14th and turned away Mascherin from the right circle in the 16th. The Troops managed just three shots, with their best chance coming in the 13th minute when Calvin Gomes’s drive from the slot was stopped by Opilka. Miller struck 24 seconds into the third period. MacInnis outmuscled McKenzie at a faceoff to Smith’s right and fed the puck to Miller, who connected from the goalmouth. Penalty killer McKenzie got the Troops on the board after Mathew Santos received a major and game misconduct for checking from behind. McKenzie stripped Brian Brosnan of the puck at the lip of the crease and poked it between Opilka’s legs. Defenceman Liberati scored at 19:56, hammering the puck past a screened Opilka from the top of the left circle. McKenzie, who made a back pass, and Mike Baird drew assists on the rush. The Battalion hosts the Sarnia Sting at 7 p.m. Friday. The Troops will wear Centennials uniforms against the Sting, the head coach and part owner of which is onetime North Bay defenceman Derian Hatcher. 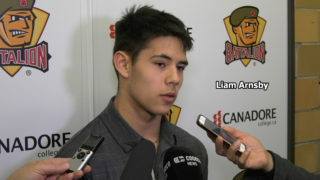 BATTALION BULLETS: Gomes, 19, saw his first action since Dec. 12, 2013, in a 4-2 home-ice win over the Barrie Colts. Having suffered from a series of shoulder problems, he has played a total of 19 games since joining the Battalion in the 2012-13 season, the Troops’ last in Brampton … The Battalion went 0-for-2 on the power play. 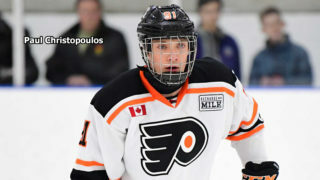 Kitchener was 0-for-4 … Liberati was credited with a team-high seven shots on goal … Opening line combinations included Amadio centring left winger Bratina and right winger Santos, McKenzie centring left winger Baird and right winger Poirier and Kyle Potts pivoting left winger David Sherman and right winger Gomes. Max Kislinger centred left winger Owen Green and right winger Kyle Moore … Battalion scratches were Austin Kosack, Kyle Wood, Justin Brazeau, Jacob Ball and Brady Lyle … Defenceman Wood was assessed by the Denver surgeon who operated on a wrist bone and isn’t expected to be ready to return until at least mid November … Poirier and Battalion rearguard Cam Dineen were among 53 OHLers named this week to the National Hockey League scouting department’s ‘Players to Watch’ list for the 2016 NHL Draft, to be held June 24-25 at Buffalo … The Rangers were the only team to play just one game over the OHL’s first week.